HOULTON, Maine — Students from Greater Houlton Christian Academy showed off their scientific prowess on April 9 during the school’s annual science fair. Because GHCA is a Christian school, each student also must include a Biblical verse that somehow connects with their project. Students were divided into two groups — grades 7-8 and grades 9-10 — for the purpose of judging exhibits at the science fair. Top finishers for junior high were: 1, Anton Mowrey; 2 (tie), Samuel Duff and Vir SinghRanger; and 3, Sadie Thompson. Honorable mentions were given to Grace Flewelling, Anicia Whited and Drew Duttweiler. Top finishers for grades 9-10 were: 1, Jessica Quint; 2, Alyssa Nightingale; and 3, Joel Carmichael. Silas Nadeau, a seventh-grader, based his project on how baking soda and vinegar react chemically to release gas. His display included a balloon affixed to the top of a soda bottle. 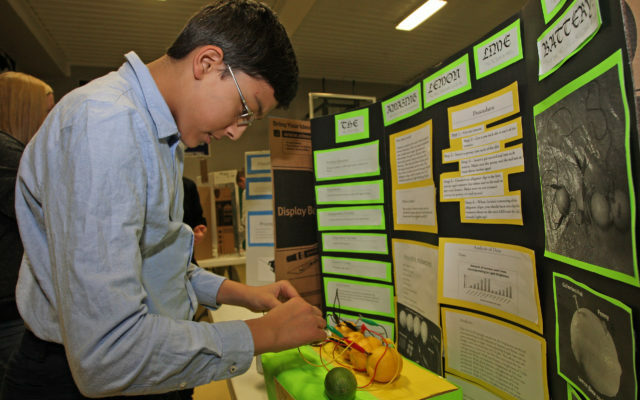 SinghRanger, also a seventh-grader, based his project on how the acids in lemons and limes can be used to conduct electricity. SinghRanger said his idea was based on finding alternative sources of power. Josh Simoes, a sophomore at GHCA, had one of the more colorful displays as he tried to determine whether black is actually a color or the absence of color. For his project, Simoes had three colored light bulbs (red, green and blue) and placed a marker behind the lights to see what color the shadow would be. While the blue light produced a blue shadow, the red light created a green shadow and the green light produced a red shadow. “From this study, I concluded that black is less of a color and not the absence of color,” he said.